The once familiar sight of a red and white striped booth is in danger of disappearing from British beaches with over one in three children (37 per cent) saying they have never experienced a Punch & Judy show. In comparison, 78 per cent of adults used to watch at least one show a year when they were children. 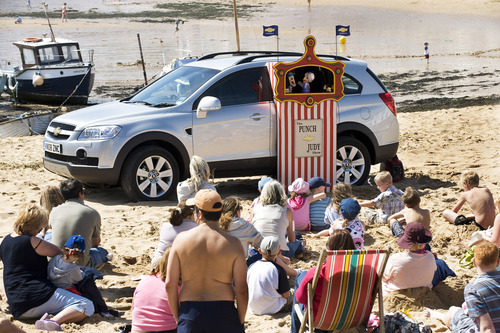 In an effort to save the show, Chevrolet, the car maker synonymous with value for money, has created the world’s first in-car Punch & Judy theatre. The custom-made booth fits onto the side of a Chevrolet Captiva allowing Punch & Judy Professors to perform from the back seat of the car. The free mobile show will tour up and down the country this summer bringing the fun of old-fashioned entertainment to a new generation of beach goers. The research of over 1,000 UK families revealed that as well as the Punch & Judy show falling out of favour, other traditional beach entertainment is also in decline with 41 per cent of today’s children have never been on a donkey ride (compared to 26 per cent of their parents) and 73 per cent have never taken part in a sand castle competition. UK parents will take at least three trips to the British seaside this summer, but with a day’s beach entertainment costing an average of £73 it could be an expensive outing. Indeed, three quarters (74 per cent) of parents say they feel anxious about the cost of keeping the family entertained over the summer holidays. This press release was distributed by ResponseSource Press Release Wire on behalf of Mischief PR in the following categories: Children & Teenagers, Leisure & Hobbies, Women's Interest & Beauty, Motoring, Travel, for more information visit https://pressreleasewire.responsesource.com/about.